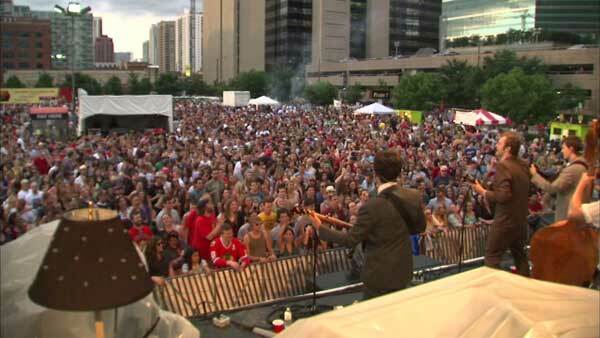 CHICAGO (WLS) -- The bands headlining Old St. Pat's World's Largest Block Party were announced Thursday. Neon Trees and Young the Giant will play the main stage. More than 15,000 people are expected to celebrate with music, food and drinks. The block party also has a new home this year. It will be held at the UIC Festival Lot in the West Loop from 5:30-10:30 p.m. on Saturday, June 27. There will be shuttles from Old St. Patrick's Church at the corner of Adams and Des Plaines streets to the entrance gate of the UIC lot on Morgan Street between Taylor Street and Roosevelt Road. They are scheduled to run from 5-8 p.m.
Tickets go on sale May 18. Proceeds support Old St. Patrick's Church and the Center for Social Concerns on the Old St. Pat's Campus which houses the following outreach programs: Horizons for Youth; Career Transitions Center of Chicago and the Global Alliance for Africa.